What is Curtain Walling? Also referred to as Facade Glazing, aluminium curtain walling has enabled building design to be transformed in recent years with an aluminium product designed to create large glazed areas and to cover entire buildings in glass. Curtain walling is an external building facade produced with framing made mainly of metal, timber or PVC-U, usually consisting of vertical and horizontal structural members, connected together and anchored to the supporting structure of the building, which provides, by itself or in conjunction with the building construction, all the normal functions of an external wall, but does not contribute to the load bearing characteristics of the building structure. Aluminium Curtain Walling is usually non structural and has for a number of years been a very good way of keeping down construction costs. A significant advantage of curtain walling is that much more natural light is available compared to windows in typical brick openings. Aluminium Curtain Walling can now be found in our homes as well. 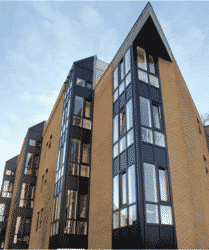 Curtain Walling has been used for several years now to apartment buildings where it spans several dwellings. Whilst the majority of curtain walling is installed in modern office buildings and commercial buildings generally, the product has found itself in our homes. Many of today’s modern apartment buildings have curtain walling spanning several floors and apartments creating a seamless facade with no walls to be seen. In houses too, homeowners are creating homes with vision and design at the forefront. Whether they are building from scratch or renovating and extending their current home, the demand for larger glass areas and more natural light is greater than ever before, evident in the complexity of window installations compared to previous years. You will see many of these types of houses featured in Grand Designs type television programmes where the vision is for maximum light to flood in with large glass “walls” and floor to ceiling glazing often spanning the ground and upper floors of the house. It is in these types of designs that curtain walling is used. Whilst there are aluminium windows that can be coupled to form large spans, the natural structural integrity of curtain walling makes it the best product for spanning more than one floor whilst retaining slimmer sight lines than windows, typically only 50mm. This is critical in creating the “wall of glass” effect. There are also Structural Glazed curtain walling systems that do away with any external aluminium profiles, truly creating that seamless glass facade. Not only this, but Curtain Walling can be either fully glazed or have opening windows, bifolding doors, patio doors or french doors can be integrated into it. The curtain wall façade does not carry any load weight other than its own dead load weight. Curtain walling will meet the latest standards for wind and water penetration and will integrate with a variety of glass systems as well as all types of windows and doors. 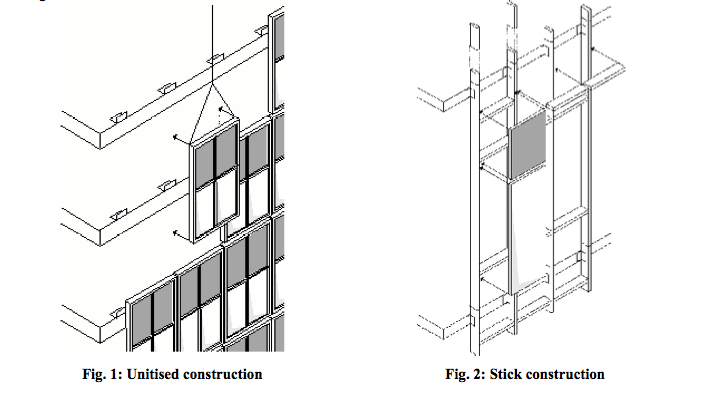 Aluminium curtain walling will be available in either modular or stick form, depending on the system. Mullions and transoms are available in a variety of depths to suit the site condition or load and external cappings are again available in profiled or standard forms to accommodate special designs if needed. Curtain walling is highly desirable in today’s modern buildings and the plastic window industry has also brought out curtain walling systems in an effort to be involved in this specialist sector. However, these PVCu products will normally be aluminium or steel inner sections clad with plastic and they still cannot achieve the look of the aluminium variety nor can they achieve the spans. One consideration for architects in specifying curtain walling is solar gain, thermal and visual comfort which will be a consideration. Furthermore the difference between curtain walling and shopfront systems is that curtain walling will normally be used when it is intended to span multiple floors.